What Is The Best Double Stroller Brand On The Market In 2018? Everybody loves a stroll. Some people can’t get enough of the outdoors and just have to hike or go exploring somewhere. But what happens when a person with love for the outdoors settles down and decides to have a family? Does that mean their career as an adventurer is over? Of course not! And that is precisely why some companies have come up with baby strollers made to suit the outdoors. With the help of these strollers, you can travel around as much as you want and take your babies with you! These baggies are available in stores and also on the internet at a price range of $400-$600 (Maclaren/City Mini GT), or you could get cheaper models from manufacturers like Graco for around $150. Therefore, it’s worth checking out what you can get in the bargain. Available in the colors black and flint, these sturdy-looking strollers seem to be fit for infants or toddlers. They are made of durable 100% polyester and are 25” wide; that’s as wide as a single buggy, and it is the narrowest buggy available. Many Mountain Buggy double strollers take two travel systems, and the cots are individual and can be removed. Each of the seats also contains individual recliners and sun-hoods so you can tend to both babies separately. And to complete the structure, the wheels are compact 10” with automatic lock and easy release. Combined, the two baby-cots can carry 80 pounds with an additional 11 pounds on the tray. Available in popular online stores, the Graco double prams are made of a combination of plastic, metal, and polyester. Even though the Graco Quattro Tour Duo Double pushchair looks bulky, the stadium seats and standing-fold closes easily with one hand, which allows for ease of transporting and which also leaves one arm free to tend to the babies. The two seats can carry 40 pounds each, and there is also a cup and snack holder on the front-seat of the Quattro. Both seats can easily be reclined, and the Duo Glider allows the back seat to be reclined completely to let the baby take a nap. The bottoms of both pushchairs have a massive drop-down tray that allows an extra area to carry things. Another excellent example of two-seater stroller is the Graco RoomFor2 Stand and Ride Classic Connect that is best suited for kids of different age. Baby Jogger strollers are more suited to the city rather than outdoor adventures and are available for the price of $400-$600. 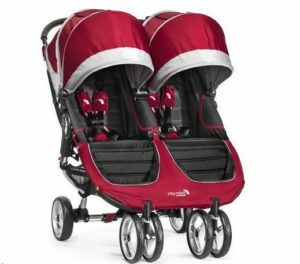 The Baby Jogger City Mini GT Double Stroller is available in three colors (red, blue, and black) and is equipped with a patented quick-fold technology that allows you to fold them in one-step. Armed with handlebars that could be altered according to users of all heights, this pram has a large canopy that keeps the children shaded. The tires are just right for all terrains, and the seats are well-padded, proving to be comfortable for the riders. The City Mini Double Stroller consists of an under-seat storage basket, which allows the user to keep necessary items, while out for a walk. This product is available in gray and black, adorned with tires that absorb shocks due to uneven roads. 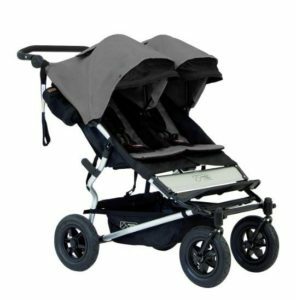 This jogger also comes with a canopy of the perfect size, including a peekaboo window which enables the user to keep an eye on the children inside. 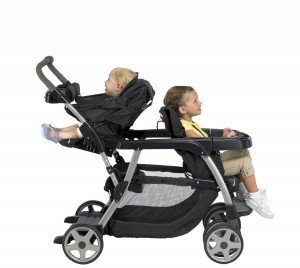 The Maclaren double strollers come in a gray color, having the ability to hold a total of 110 pounds. Unfortunately, some of the models often are not available on Amazon. Like the previous models, these are also made of a mix of plastic, polyester, and metal and is also sturdier. Both cots are separate, have multiple seat positions, and a UV protected lid that is also rain-proof. 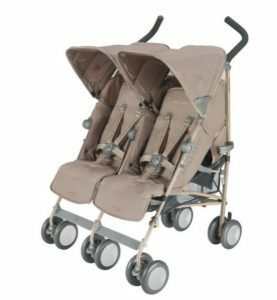 Unlike the other models, these come with both front and back suspension, and the prams can be used any place, though only city use is recommended. There are many models of baby carriages out in the market, but if you were to choose from them, the best decision would be purchasing one of the models from reviewed brands.